After multiple years of being recognized as a Top Doctor, Dr. Jon Paul Trevisani of the Aesthetic Surgery Centre takes the local magazine’s annual “Doctor of the Year” honor. 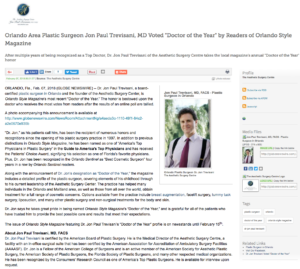 Orlando, FL – Dr. Jon Paul Trevisani, a board-certified plastic surgeon in Orlando and the founder of the Aesthetic Surgery Center, is Orlando Style Magazine’s most recent “Doctor of the Year.” The honor is bestowed upon the doctor who receives the most votes from readers after the results of an online poll are tallied. “Dr. Jon,” as his patients call him, has been the recipient of numerous honors and recognitions since the opening of his plastic surgery practice in 1997. In addition to previous distinctions in Orlando Style Magazine, he has been named as one of “America’s Top Physicians in Plastic Surgery” in the Guide to America’s Top Physicians and has received the Patients’ Choice Award, signifying his selection as one of Florida’s favorite physicians. Plus, Dr. Jon has been recognized in the Orlando Sentinel as “Best Cosmetic Surgeon” four years in a row by Orlando Sentinel readers. Along with the announcement of Dr. Jon’s designation as “Doctor of the Year,” the magazine includes a detailed profile of the plastic surgeon, covering elements of his childhood through to his current leadership of the Aesthetic Surgery Center. The practice has helped many individuals in the Orlando and Maitland area, as well as those from all over the world, obtain treatment for a full range of cosmetic concerns. Options available from the practice include breast augmentation, facelift surgery, tummy tuck surgery, liposuction, and many other plastic surgery and non-surgical treatments for the body and skin. Dr. Jon says he takes great pride in being named Orlando Style Magazine’s “Doctor of the Year,” and is grateful for all of the patients who have trusted him to provide the best possible care and results that meet their expectations. The issue of Orlando Style Magazine featuring Dr. Jon Paul Trevisani’s “Doctor of the Year” profile is on newsstands until February 15th. Dr. Jon Paul Trevisani is certified by the American Board of Plastic Surgery. He is the Medical Director of the Aesthetic Surgery Centre, a facility with an in-office surgical suite that has been certified by the American Association for Accreditation of Ambulatory Surgery Facilities (AAAASF). Dr. Jon is a Fellow of the American College of Surgeons and is an active member of the American Society for Aesthetic Plastic Surgery, the American Society of Plastic Surgeons, the Florida Society of Plastic Surgeons, and many other respected medical organizations. He has been recognized by the Consumers’ Research Council as one of America’s Top Plastic Surgeons. He is available for interview upon request. To learn more about Dr. Jon Paul Trevisani and his practice, please visit jptrev.com, usabreast.com, and facebook.com/DrJonTrevisani.